First and foremost: Thanks to Phil for minding the store while I was on the road, and thanks to all of you who sent me birthday wishes yesterday. You’re all the best. 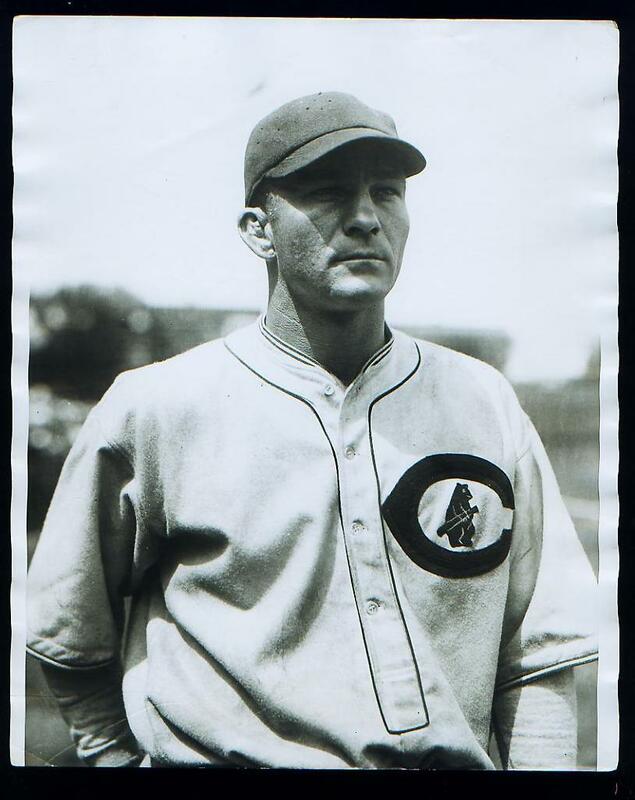 • We’ve often discussed the way old-time ballplayers used to wear their belt buckles off-center. But this 1930 photo appears to show Art Shires wearing his buckle fully around to the back! Never seen that before. • You’ll never see a better view of the World’s Fair patches that all three New York teams wore in the late 1930s than in this shot of the Babe. 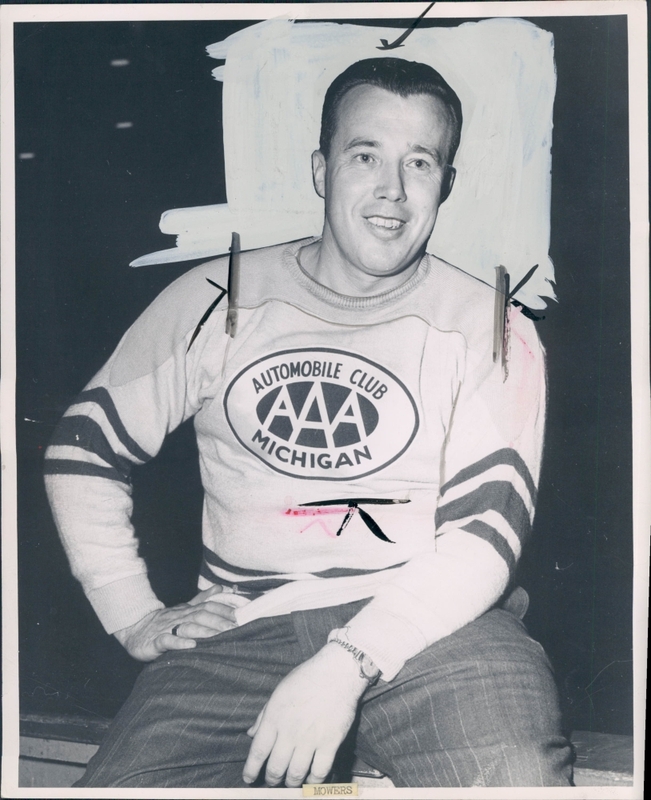 • Speaking of sleeve patches, here’s the flag shield that the Senators wore in the 1940s. 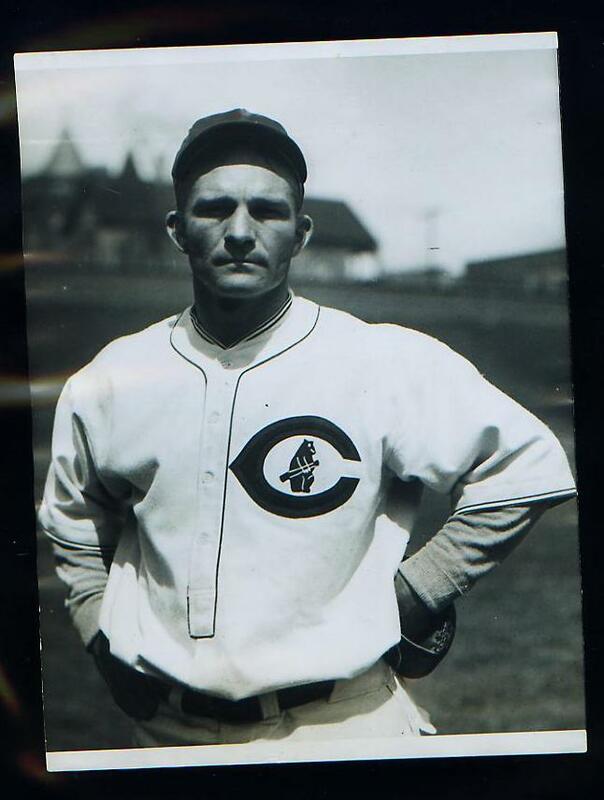 • Sticking with the sleeve theme, here’s an odd sight: Chuck Klein and Ralph Terry, both with their cap logos repeated on their sleeves. Note that Klein also has a huge memorial armband (I believe for team owner William Baker), which means both his sleeves were carrying massive graphics. • One more sleeve shot: Check out the team name on Zach Taylor’s sleeve. • I was interested to see the insignia on this late-1920s White Sox jersey. Note the two-color lettering — that doesn’t jibe with anything shown in the Okkonen archives. Intriguing. • Similarly, Okkonen shows the late-’20s Cubs wearing a red wishbone C with blue outlining. But it was apparently a lot more than just outlining. Here’s another view that confirms that assessment. • I don’t mean to pick on Okkonen, mind you. Indeed, his archive is loaded with so much data that it’s easy to overlook noteworthy designs that get lost in the shuffle. 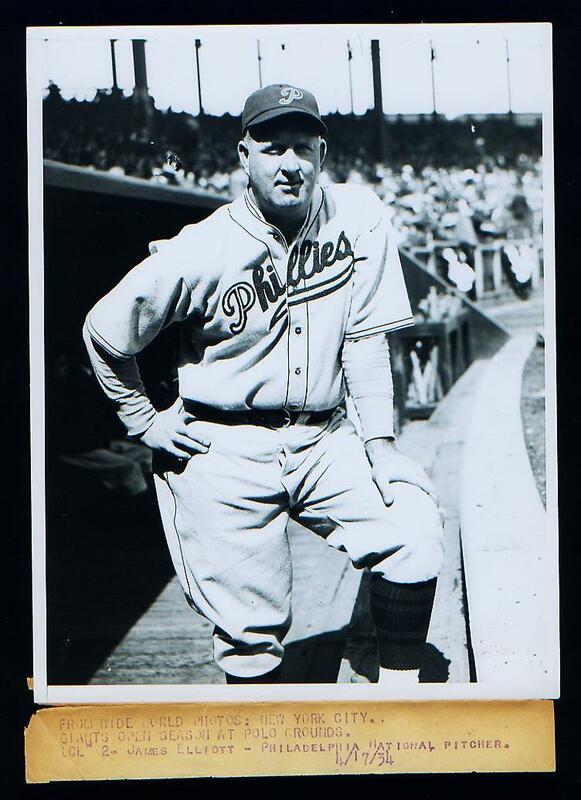 Case in point: I’d never really paid much mind to the Phillies’ 1934 road uni until I saw this photo. Weird to have the white P and the white tail on the s, right? • This one was simply listed as “Unknown player, unknown team. I kinda like the huge D (or is it an O? ), and I particularly like the dark sleeve trim. 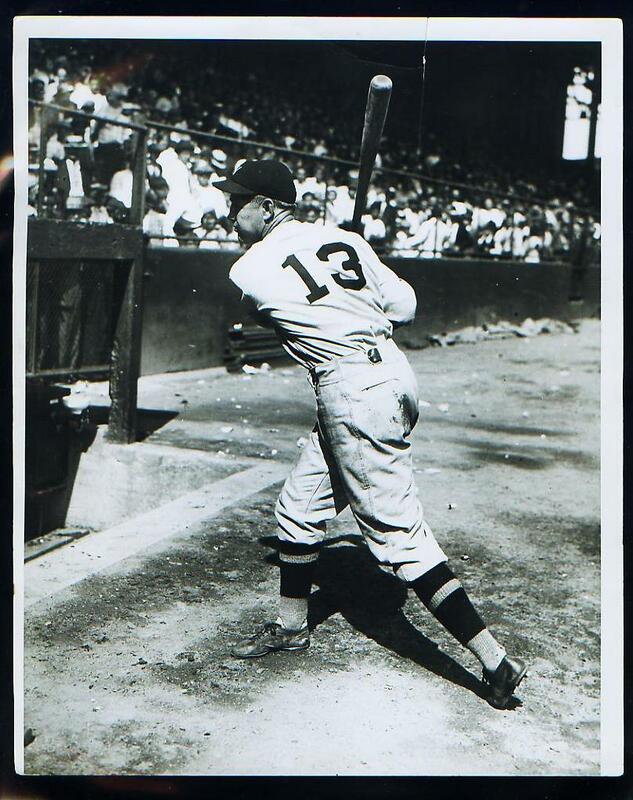 • On 8/31/50, Gil Hodges went 5-for-6 with four home runs and nine RBI. 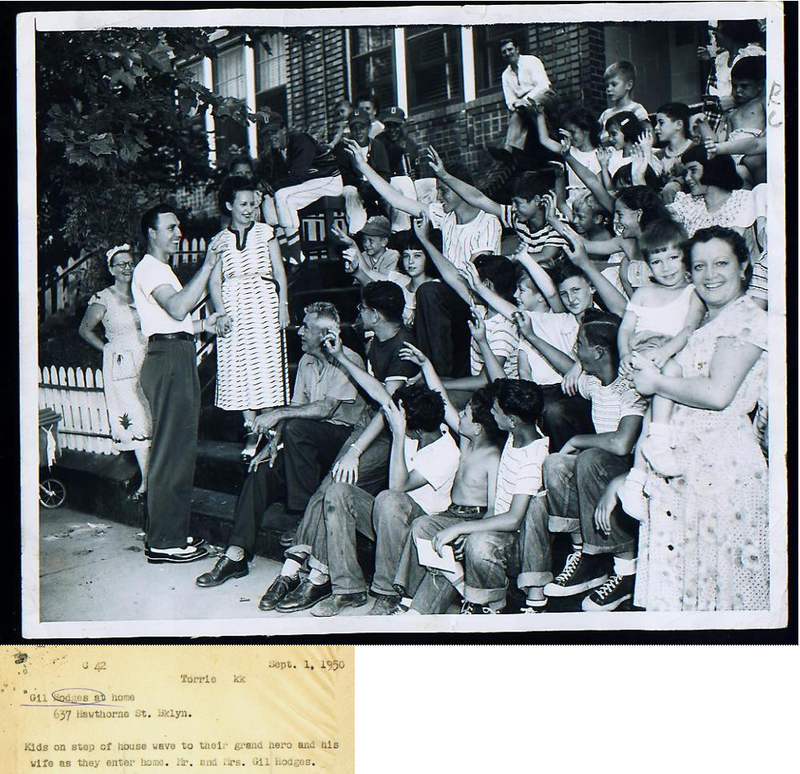 When he and his wife returned to their Brooklyn home after the game, there was a bit of a crowd waiting to greet them. I’m not sure which I like better: Gil’s shoes or the stirrups on the guy behind his wife. • Before Gatorade was invented, getting a drink was a bit more primitive. 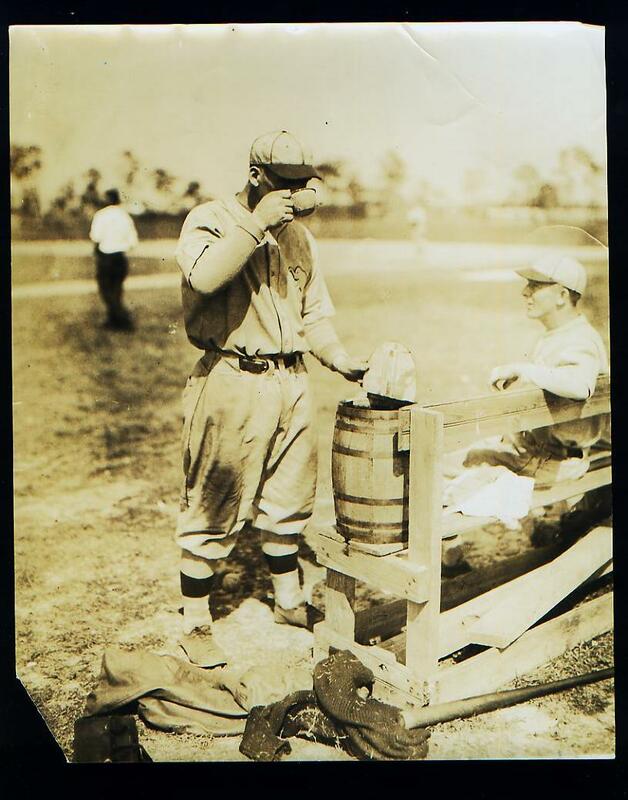 That’s from the A’s 1928 spring training camp. • Boxers often wear dark glasses after a fight, but I’d never seen a baseball player doing that until now. 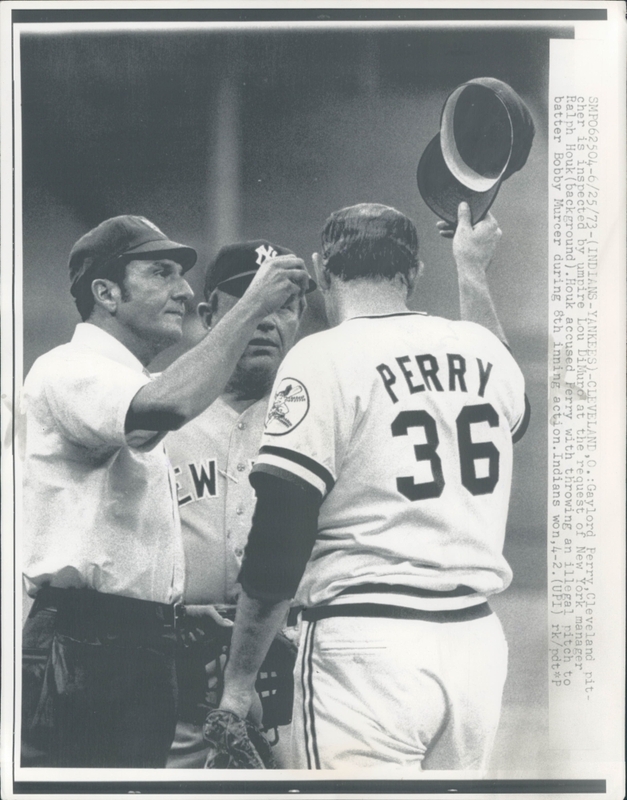 • I wonder how many photos there are of Gaylord Perry being checked by the umps. 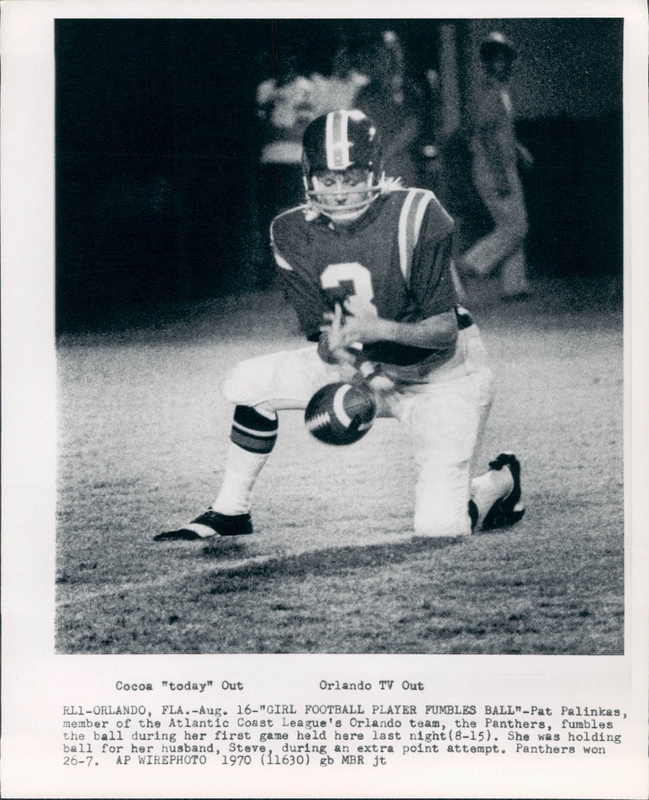 • I’d never heard of the Atlantic Coast Football League, but apparently one of their teams — the Orlando Panthers — had a female player. • Gotta love this AAA hockey jersey. 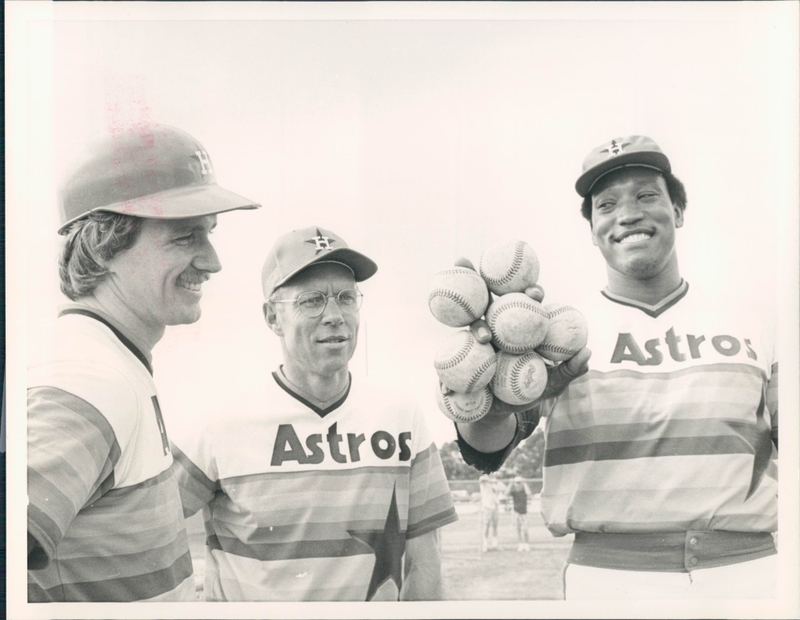 • J.R. Richard had mighty big hands. 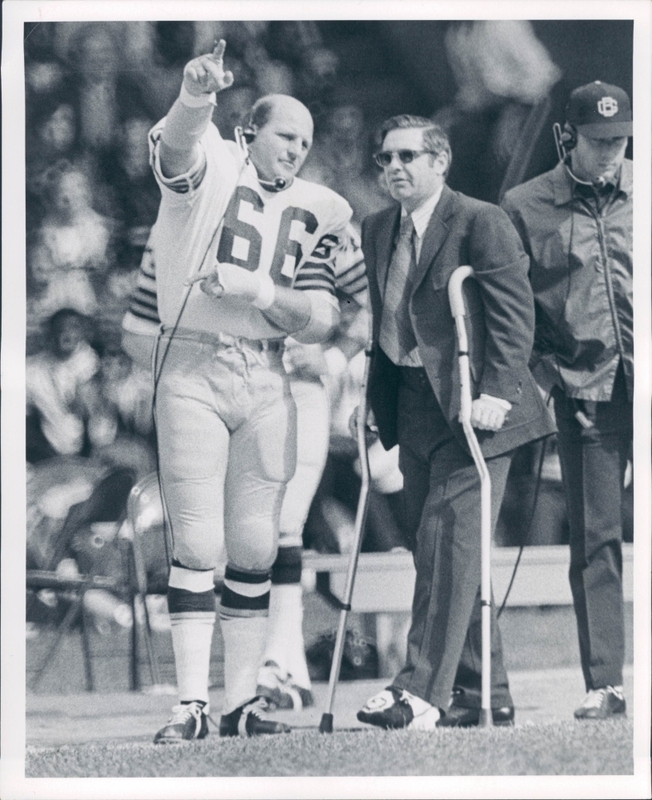 • Here’s an odd role-reversal shot of Ray Nitschke wearing the headset while Dan Devine watches. • Finally, here’s yet another reason to wear striped stirrups: You look a lot better if you get knocked out by a line drive. 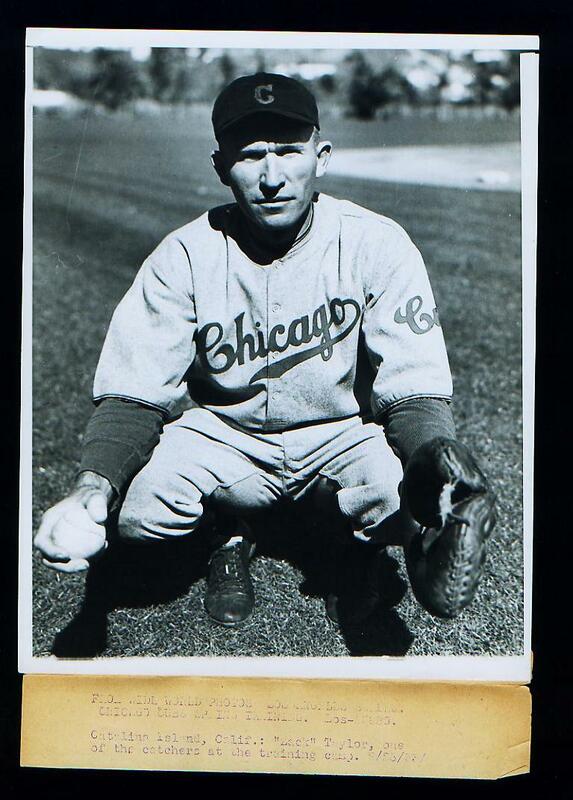 That’s Cards pitcher Ted Wilks, who took a comebacker in the jaw during a 1947 game. Don’t worry, he was fine and ended up pitching for six more years. Didn’t Paul link us a week ago or so to the 300 page guide of branding so all arenas who got the games let people who are tuning in “Know they are watching an NCAA game…” ? What’s the point of playing in different cities if it all looks the same…and why doesn’t any one use a parquet floor anymore…? 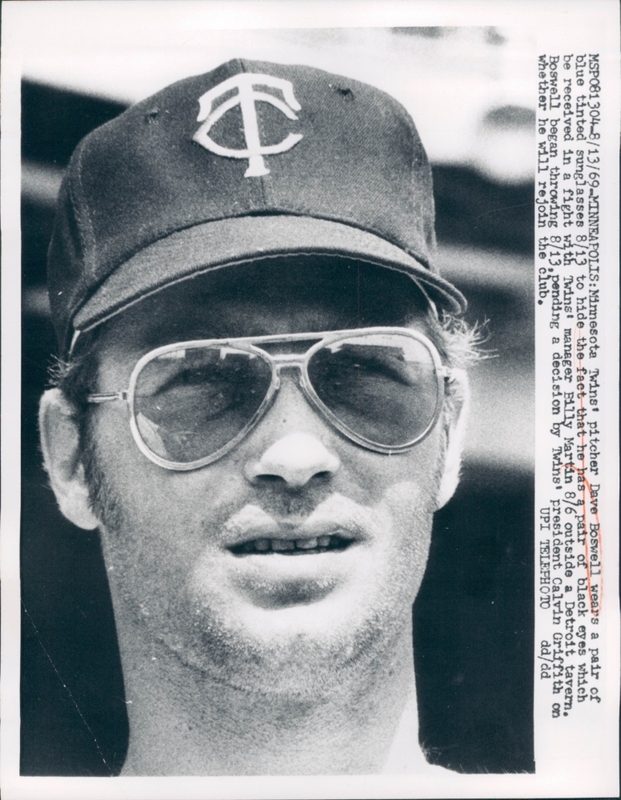 Note the artificial turf in the background of the first Gaylord Perry photo. 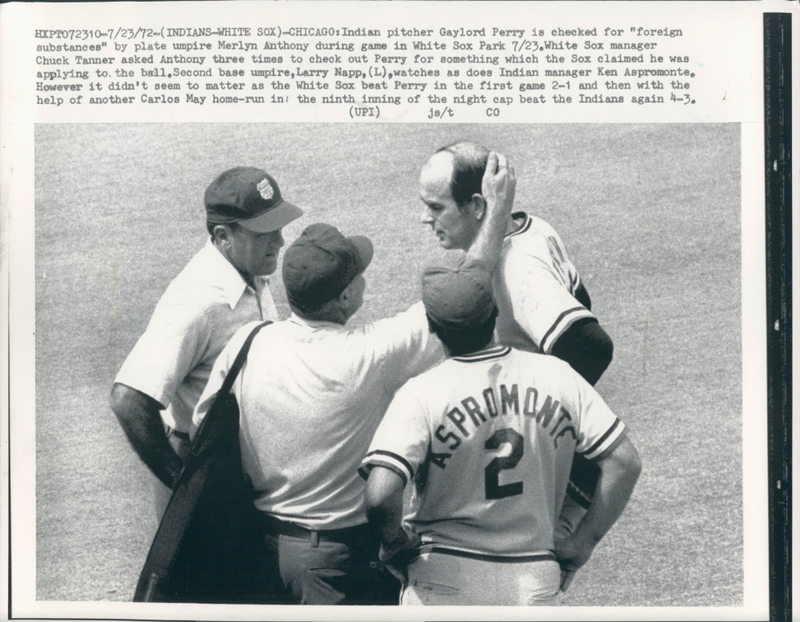 The cutline says the photo was taken from an Indians-White Sox game, so that means it occurred at Comiskey Park when the Sox had the artifical turf infield. I don’t very often think of the White Sox and turf in the same context. Kinda like the SF Giants/49ers and that phase in the ’70s when Candlestick had turf. 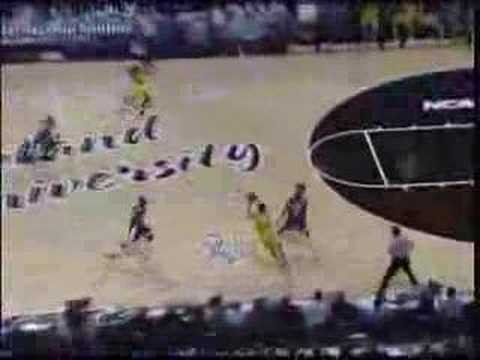 I believe that a lot of the unified NCAA court appearances ties back to a few years ago when Oakland U’s court at The Palace had the school name stretched from three point line to three point line. I can not find a pic. Yet. Perhaps some of the noted uni-details (Cubs, Sox) are too subtle to be reproduced in the fashion Okkenen uses on the site? According to the book “Colors” Nike went to both the Steelers and Broncos with its newfangled uniform ideas. The Steelers said no but the Broncos said yes, with the unfortunate results that followed. Are the stirrups on that Catamounts player backwards? The reverse-color thing looks great on the tail. Not so much on the P. Keep it to the tail, and this would be a great, distinctive lettering style for any of the many MLB teams with essentially identical underlined scripts. The Angels didn’t wear BP caps at all the first couple weeks of spring training. They wore their regular game caps. Perhaps they asked New Era for a design change and they had to wait for the hats to be made and delivered. The three New York City teams wore the World’s Fair emblem in 1938. In 1939 all 16 teams wore the bicentennial patch. The Giant is Bill Terry, not Ralph Terry. All teams wore the flag patch after 1942. The catcher running out to see to Ted Wilks is Joe Garagiola. A great series, by the way. 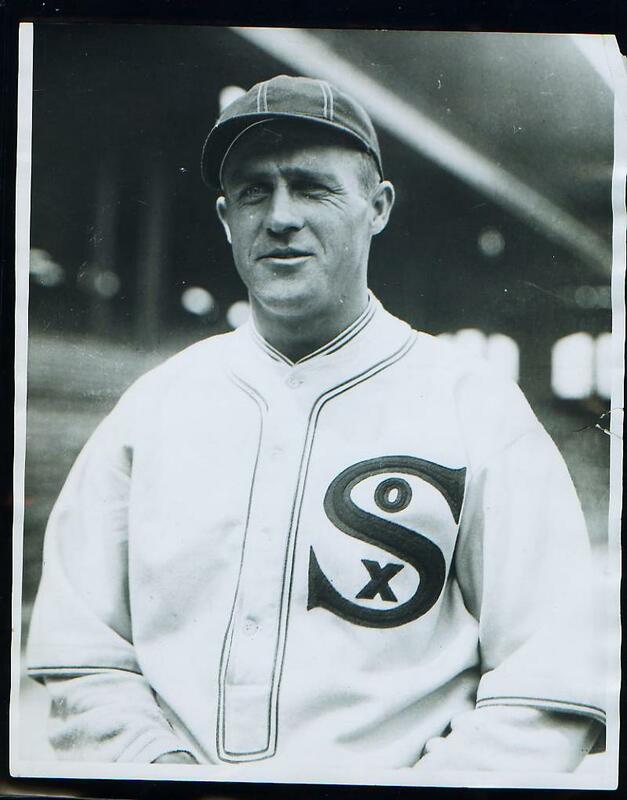 – I was interested to see the insignia on this late-1920s White Sox jersey. Note the two-color lettering – that doesn’t jibe with anything shown in the Okkonen archives. Intriguing. Anyone else having problems with the photos stored on “farm3” on Flickr? Even weirder than the whole same floor thing was noticed when I attended the first round games at the Wachovia Center in Philadelphia last year. EVERY and i mean EVERY advertisement in the building was covered or removed… from the giant red-lit “WELCOME TO COMCAST COUNTRY” on the 3rd deck faÃ§ade on both sides of the arena down to the “Motrin” signs on every step return on the lower deck. But, perhaps the worst thing was NO BEER! Every beer tap in the building had it’s top removed. So sad. We like to rip the intrusion of advertising on here but without it the arena is a bit sterile… and dry. [quote comment=”382505″]Are the stirrups on that Catamounts player backwards? Or fake!! What the hell is that?? I wasn’t able to post yesterday (the site doesn’t like my iPhone), so I just wanted to say a huge congrats to Brad on his win, and thanks to Phil, Justin, Ricko, and the rest of the usual suspects for all their work getting the contest together. And happy belated birthday, Paul! – I don’t mean to pick on Okkonen, mind you. Indeed, his archive is loaded with so much data that it’s easy to overlook noteworthy designs that get lost in the shuffle. 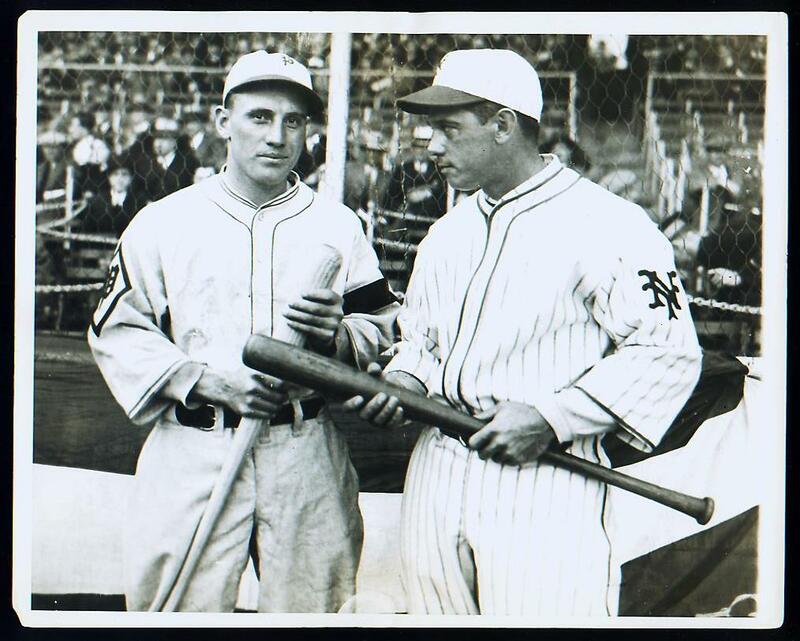 Case in point: I’d never really paid much mind to the Phillies’ 1934 road uni until I saw this photo. Weird to have the white P and the white tail on the s, right? Were the Bruins wearing their recycled Winter Classic jerseys (i.e., was the WC patch simply removed) or were these new-issued throwback alts? 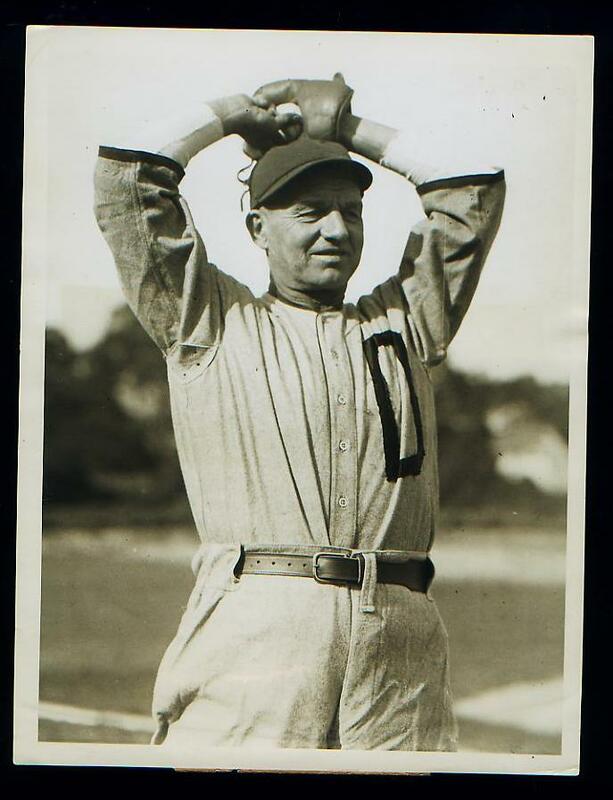 [quote comment=”382509″]– I was interested to see the insignia on this late-1920s White Sox jersey. Note the two-color lettering – that doesn’t jibe with anything shown in the Okkonen archives. Intriguing. I was thinking the same thing. Appears to be (according to the Okkonen image) the road cap paired with the home jersey. I’ve never liked logos on sleeves–in any sport–it just seems like overkill. But, I have to say, the Chuck Klein and Ralph Terry uniforms look pretty damn cool. 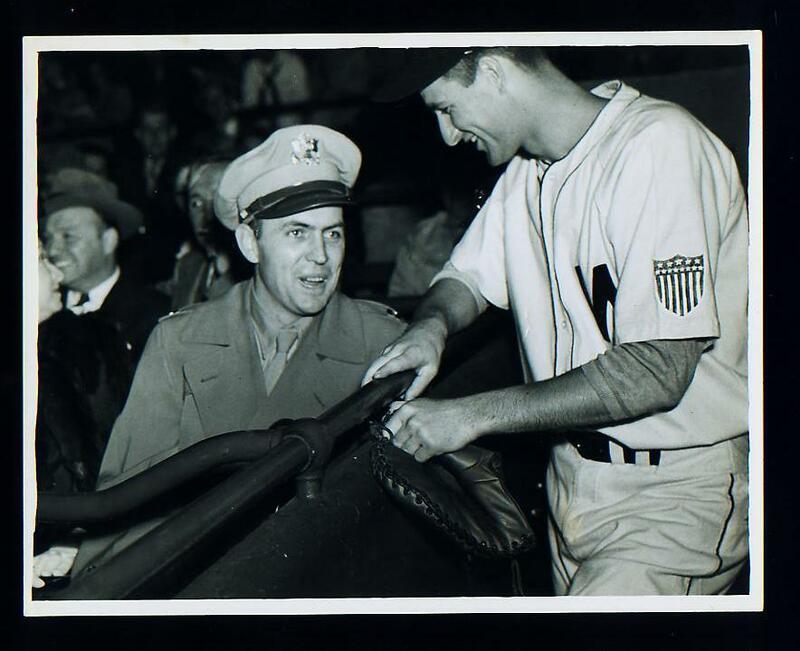 And that Worlds’s Fair patch on the Babe’s sleeve is one of the great designs of our time. Talk about achieving magnificence through restraint and simplicity. [quote comment=”382518″][quote comment=”382509″]– I was interested to see the insignia on this late-1920s White Sox jersey. Note the two-color lettering – that doesn’t jibe with anything shown in the Okkonen archives. Intriguing. No, wait. Looks more like the 1929 home uni, just that Okkonen depicts it only in navy & white. They were the Winter Classic jerseys (ahem, sweaters) with the patch removed. B’s first national TV appearance since January 1st, might have had something to do with it, but that’s just speculation. . I don’t know about hot dogs on pickles, but when I drove up to Charleston to see Willie & Dylan play at their ballpark a while back they had the most delicious pretzels I had ever had. There were like a sweetbread pretzel. So good, I had three of them…. then washed them down with delicious beer sold from a trailer parked at second base. [quote comment=”382520″][quote comment=”382518″][quote comment=”382509″]– I was interested to see the insignia on this late-1920s White Sox jersey. Note the two-color lettering – that doesn’t jibe with anything shown in the Okkonen archives. Intriguing. Have we learned nothing from last week’s B&W vs. Color lesson? Who knows what colors are depicted in that picture? It could be two layers of the same color, but thanks to lighting, they appear as seperate colors in B&W. 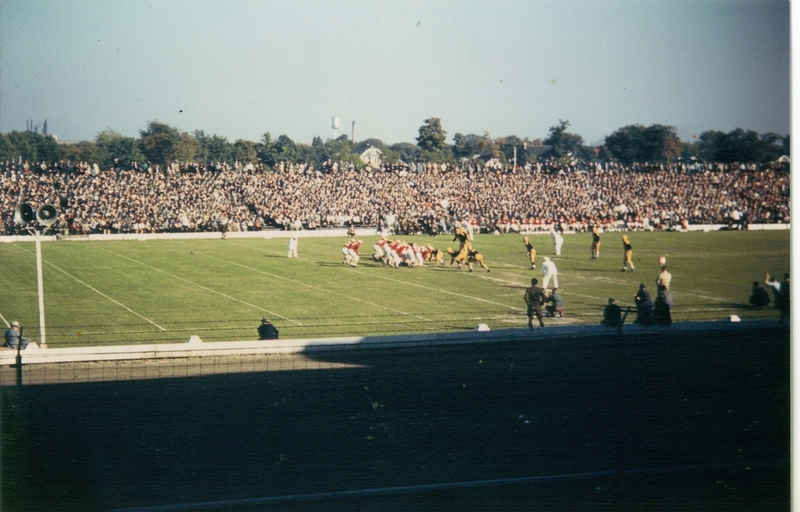 The lacrosse game in “Central Stadium.” Perhaps it was Griffith Stadium? Yes, they are. Most certainly. Guess no one around that team knows much about stirrups. Nice that they have them, but a teensy bit of research would be good. [quote comment=”382523″][quote comment=”382520″][quote comment=”382518″][quote comment=”382509″]– I was interested to see the insignia on this late-1920s White Sox jersey. Note the two-color lettering – that doesn’t jibe with anything shown in the Okkonen archives. Intriguing. That second row of stitching, farther from the outside edge, was not uncommon. It was just to hold a fairly wide expanse of satin down to keep it from “ballooning” upward. Made it look pretty, too. Extra detailing. So what it may be, in that photo, is simply light reflected at two different angles. The stitching would create something of a small “valley” and both surfaces would reflect light into that “valley” (know what I mean?). In B&W, that could make it look like we’re seeing two different colors. Not saying it’s so in that photo…just that I’ve seen that effect before. The Bruins have worn the gold Winter Classic jerseys four or five times this season. Tuukka Rask never wears laces in his jersey. Speaking of the 1939 World’s Fair, I’ve been collecting some links to the unis of the workers at the fair. Here are some samples. Girl guide wearing the Trylon and Perisphere pillbox hat. Anyone recognize this sanitation worker’s jacket? The ram looks positively Satanic. [quote comment=\”382512\”][quote comment=\”382505\”]Are the stirrups on that Catamounts player backwards? Those look poorly photoshop\’d to me. An tell-tale sign is to pull the image into photoshop and adjust the image to see curious patterns in the pixels. Note the curious pattern on the left ankle of the pitcher. That is usually a tell-tale sign. Also on his drag foot, you don\’t pick up the shadow tone on the white leg on the white sock. Looks like the white sani was added. Maybe hi-jinks…maybe not. But some curiousness. Also, for posterity, not a CSI guy or anything, so could be wrong. [quote comment=”382526″][quote comment=”382523″][quote comment=”382520″][quote comment=”382518″][quote comment=”382509″]– I was interested to see the insignia on this late-1920s White Sox jersey. Note the two-color lettering – that doesn’t jibe with anything shown in the Okkonen archives. Intriguing. That could be the case. If I were only looking at the upper half of the logo (like the top two-thirds of the S and the O), I might be willing to bet that it’s two different colors. However, if I were to only look at it from like the top of the X down, I might not even notice any contrast at all. In the black and white version, the red Patriots’ jerseys and the blue coaches’ jackets look identical, which is darker than the blue stripes on the Patriots’ jerseys. I know it’s a darker blue, but it doesn’t seem that much darker. Crazy things happen in the old-time world of color filters, I guess, but I’m having a hard time computing the fact that the Red Sox caps, which are blue with a Red B, look like they are black with a grey B in the image, but the Patriots’ jerseys, which are red with blue stripes, also look black with grey stripes. Beware – the link to that Korean hockey team site has a virus which caused my Avast Antivirus program to light up. Great job today; I can’t get enough of the wire service photos! there are no words to describe that Gil Hodges picture. None. 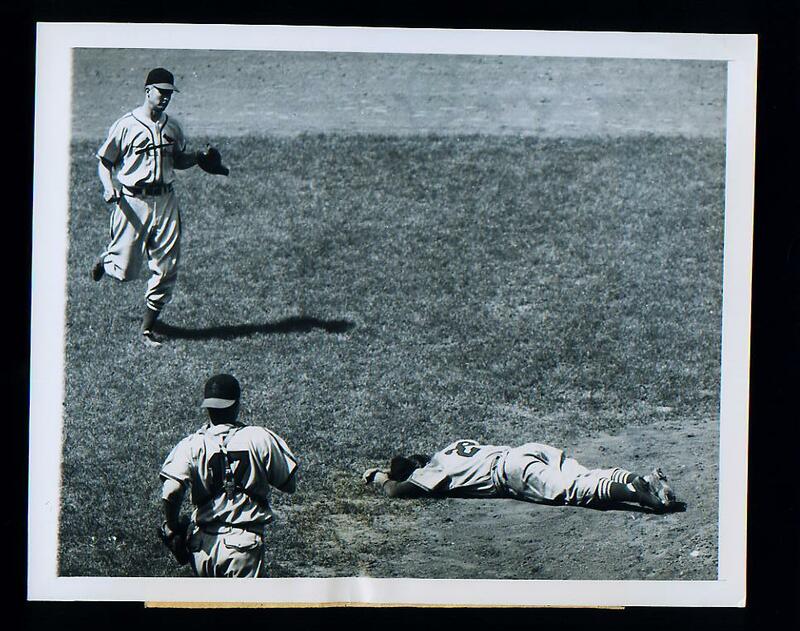 [quote comment=”382534″]there are no words to describe that Gil Hodges picture. None. I don’t know about words, but I love that his wife and he have matching shoes! [quote comment=”382529″]Speaking of the 1939 World’s Fair, I’ve been collecting some links to the unis of the workers at the fair. Here are some samples. The Angels had been wearing the original batting practice cap http://images.smarter.com/300x300x15/35/64/6063664.jpg from the time MLB came up with the ugly things. 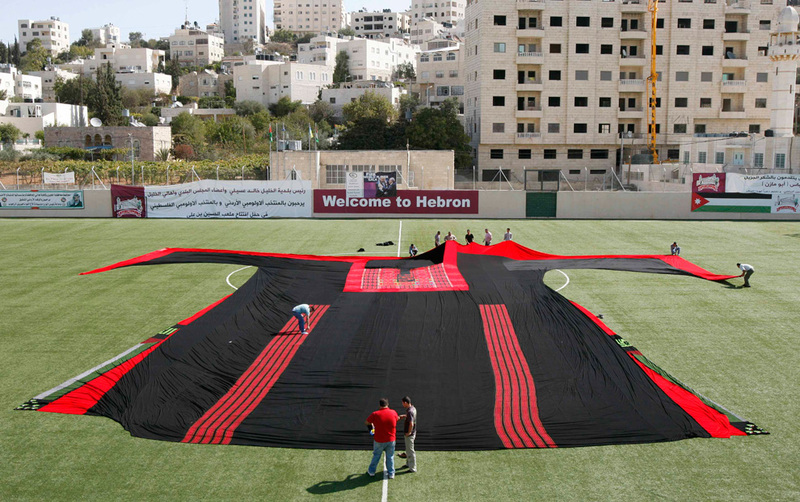 It would make sense from the previous comment on the topic that the Angels refused to wear the new design. They requested a design that looked more like their old one. The Angels also hung on to their original dugout jacket http://www.mlb-store.nowell.net/images/anaheim_angels_jacket.jpg all the way up to last season. Last season they wore this one http://product.images.fansedge.com/51-32/51-32806-F.jpg . Those jackets (like the batting practice caps) change every year, and most team go along with the changes. But the Angels havent. What I wonder is are the angels cheap and dont want to change? Or do they choose to take a stand and not make changes for changes sake? As an Angel fan I hope its the latter. I had heard of the female football player (husband and wife team, actually…as the caption says, the husband was the kicker and the wife was the holder) but had never seen a photo. Good stuff. In 1970, that was quite the oddity. It’s also not surprising they would show her fumbling a snap, because, as we all know, only women folk do that. 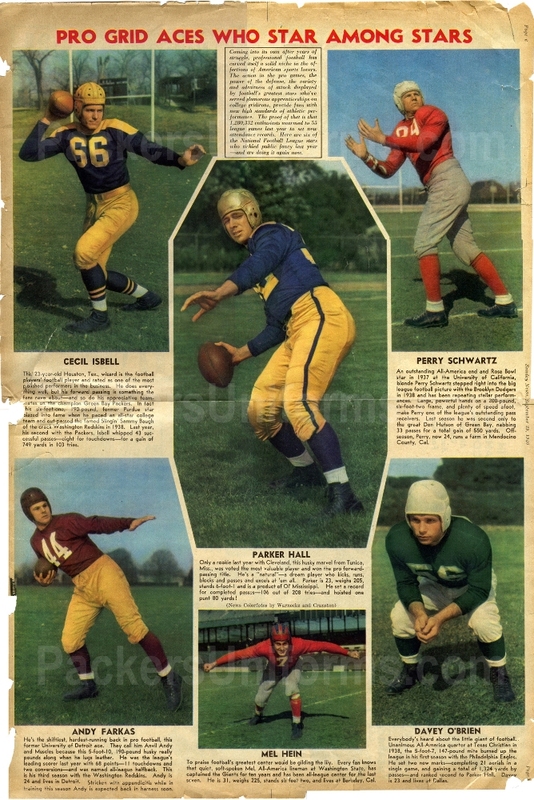 Rare color look at the 1940 uniforms of the Packers, Rams, Cardinals, Redskins, Giants and Eagles. Low-grade apostrophe error in the VT St. Patrick’s Day jersey ticker item: “it’s” is not possessive. Also, I thought I saw a story about the NCAA actually shipping the playing floors to the various tournament sites. That explains the rather depressing uniformity. I think that’s a policy for all NCAA tournament games. Yep, it’s bad enough that the uniforms mostly look cut from a template these days, but the court thing is absurd. I really miss the uniqueness of the different host arena courts. There was a charm in seeing a blue and red team play a green team on, say, an orange and black trimmed floor. The homogenized black and blue floors feel…corporate. Wow. After reading this, I figured I should run a scan myself. My desktop link to Malwarebytes was changed so that it was pointing to the “Uninstall” option rather than the program launch. I can’t say for sure that it’s related to the worm on that Korean site, but it’s mighty coincidental. 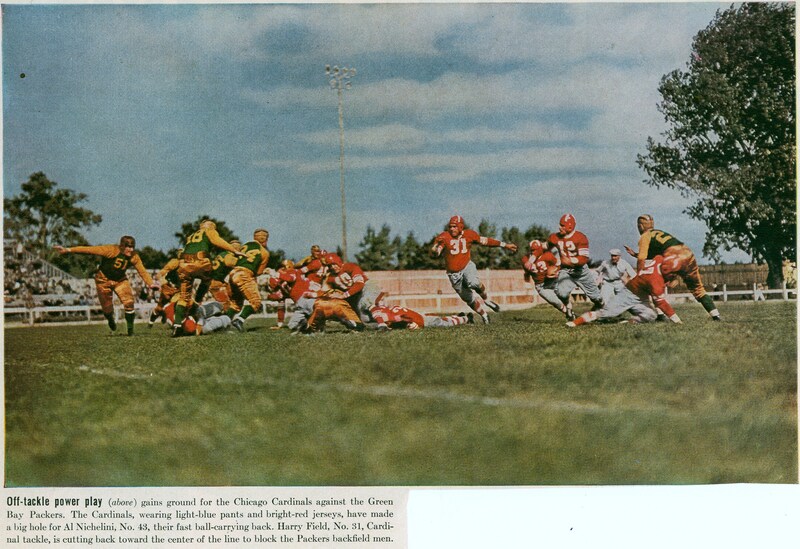 Cecil Isbell photo is for all the Packer fans who don’t get the navy & gold of the recently revealed “throwback”. “When I think of the Packers I think of green and gold”? News flash for those folks: Don Hutson, arguably one of the two or three greatest Packers ever, never played in a green Packer uni. Then again, if someone doesn’t know who Don Hutson is/was, I suppose it doesn’t matter. AGREE… it was nice watching that upset in Boise years ago and seeing that weird mural thing of a floor that they had… could you imagine if the NCAA said to the Humanitarian Bowl in Boise to rip up the blue turf? That part of the game! He’s the landlord of the building across from Lambeau Field or something, right? You know, where the Packers practice. That guy played for the team? The NFL’s pre-Super Bowl myopia is why I started my blog in the first place. I figured that I was interested in the blue and gold days, maybe others would be as well. Isbell’s a particularly frustrating case – he quit after five years, at the height of his career, because he saw how humiliating it was to be cut (not that he was in any danger). Had he played another couple years at that level, he’d be in Canton now. As it is, he’s largely forgotten. And no, he didn’t wear #66 – that was a training camp photo. Even though quarterbacks of the era could wear whatever number they liked (this was taken a dozen years before the NFL started assigning numbers by position), he was always #17 when the season started. And Ricko – without the benefit of having seen him, I’d put Hutson as the greatest Packer ever. Hands down. Heck, I think he has to be in the conversation for greatest NFL player ever. He led the NFL in touchdowns eight times – nobody else has done it more than three times. He was such a dominant player that you can’t just compare him to other players of his era – his stats compare favorably to those of entire teams. In 1942, Hutson made more receptions than three teams – Detroit Lions, the New York Giants and Philadelphia Eagles. In that same season, he scored the Pittsburgh Steelers for touchdowns, beating the Eagles, Brooklyn Dodgers, Chicago Cardinals and Detroit Lions. He has even had more than the Cardinals and Lions combined. Had the NFL been on television in those days, Hutson would be a sporting god. The NFL’s version of Michael Jordan or Babe Ruth. Instead, he’s a footnote. A trivia answer. Fate’s funny sometimes. I don’t think I’ve ever seen a school letter as big as this N.
Does his shirt say Nebr. Ath. Underwear? [quote comment=”382530″][quote comment=\”382512\”][quote comment=\”382505\”]Are the stirrups on that Catamounts player backwards? the funny thing is, had he not photoshopped the stirrups backward, we might not have noticed this. but for sure this is a fake. i have been working on some “posters” for next months revolution, and it is tough to get right. the lack of shadow on the drag is one thing, but look at the pixels around the stitching on the lead leg, they don’t jibe with the rest of the photo. he obviously had some sizing issues when he put it together. sorry rob, somehow it didn’t register in my head that you pointed out the lead leg too. [quote comment=”382556″]And Ricko – without the benefit of having seen him, I’d put Hutson as the greatest Packer ever. Hands down. I agree with you. Have long considered Hutson the most forgotten dominant player ever. Perhaps in any U.S. professional sport. Whenever the media talks of how Jerry Rice’s stats eclipse all other receivers, I always can’t help but think, “My god, how would they have treated Hutson’s status compared to his peers?” In the TV era he would be been a phenomenon of unbelievable proportions. 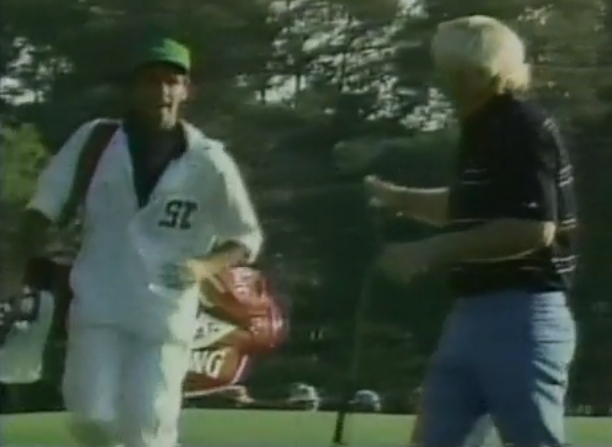 Not unlike Tiger during his invincible period. Isn’t always just the numbers, it’s how unstoppable/dominating the player was in his era. Yet most pro football fans are absolutely clueless about what a force he was. Much as George Mikan created and defined the big man in basketball, Hutson created and defined the wide receiver in football. Too bad there isn’t more game film of him. Maybe that would help. Rams wore gold helmets. Not yellow or pale blue, but GOLD. At least in 1940. Eagles did wear green prior to 1941. At least in 1940. Unclear as to what colors the Eagles wore from 1935-1939. I am thinking a lightish blue, but..
Others appear to be as I had thought. Awesome, Chance. Thanks for sharing!!! Huh. First time I looked at that, I assumed Perry Schwartz played for the Cardinals. I just figured the jersey and socks looked more like scarlet in that photo due to the film/processing/scan quality/age of the item, etc. I never would have guessed that the Dodgers wore red and gray/silver. Oops. Sorry for the double-quote. It’s been like that for a while. I don’t like the uniformity, but what I do like is the clean floor design. Today’s floors are, like many things in society, too clutterred. A typical floor now has a huge team logo across half the court, two (or three) three-point lines, and assorted corporate sponor logos. They are eyesores. You beat me to it. Yes, Perry Schwartz did play for the Dodgers as opposed to the Cardinals. The NFL editions I might add. Yes, the Dodgers did wear red as a primary color in 1940, with blue as a secondary jersey color. Sorry about that – totally bungled the Schwartz ID. 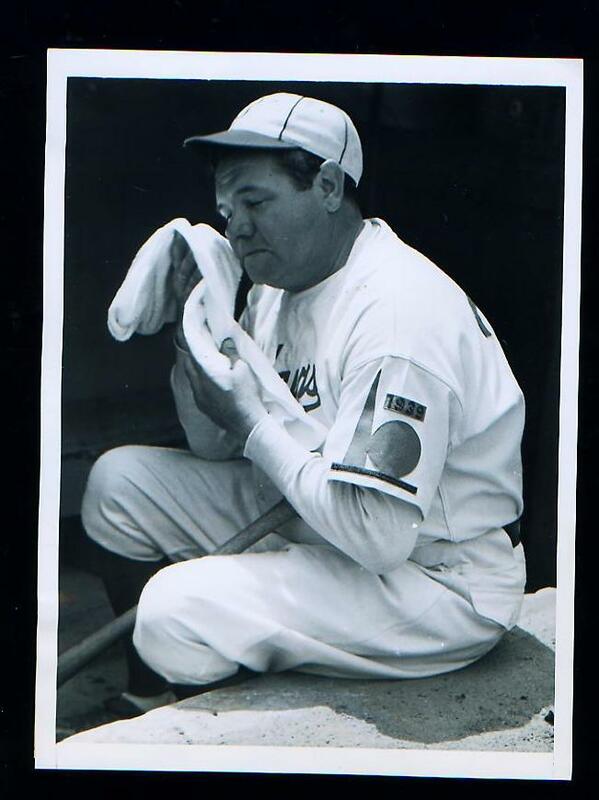 Who knew the Dodgers wore the same colors as the Chicago Cardinals? That team name is actually “NSC Minnesota”, not the other way ’round. Those kits are for the team’s inaugural season. Speaking of uniformity, it is dissapointing to see all these schools in black uniforms when their colors are not black. I list Washington and Vermont as examples. Both wore black in the first round. Washington’s colors are purple and gold. Vermonth’s are green and gold. They’re distinctive when they wear their colors, but when they wear black they look like just so many other teams. [quote comment=”382568″]Sorry about that – totally bungled the Schwartz ID. There are so many things to like about that photo that I think the only thing I don’t like about it is the fact that the caption doesn’t include the location of the game. As I recall, the Packer colors, originally, were blue, green, and gold. The current jerseys of bluish green/greenish-blue (take your pick) are a a late 1950s phenomenon, as are the yellow — not gold — helmets. [quote comment=”382571″][quote comment=”382568″]Sorry about that – totally bungled the Schwartz ID. True enough. Looks like old City Stadium in Green Bay to me, with the bleacher drop-off. It certainly isn’t Wrigley Field, where the Cardinals played in 1935-1936, nor does it look like Wisconsin State Fair Park. Well, athletic gold. As different from yellow as teal is from sky blue. The Packers’ colors were originally navy and gold. Green was added in 1935, and the Packers wore uniforms of blue and gold and green and gold (but never all three) at various points. All three were listed in the NFL guide as official colors well into the 1960s, but I don’t recall exactly when. You really think the current Packer jerseys are a “bluish green”? Had the NFL been on television in those days, Hutson would be a sporting god. The NFL’s version of Michael Jordan or Babe Ruth. Babe didn’t have TV either. It still amazes me that Jordan won ESPN’s Sportsman of the Century over the Babe and Ali – even with the late 20th century consumerist machine behind him he didn’t have the cultural impact of Babe or Ali. True, the Babe didn’t have television, but that shows the cultural importance of baseball. I was actually thinking more along the lines of football needing television to become the impact sport it is today. If Hutson had been playing when that happened, he would be better recognized for his accomplishments. I found a pic dated 1930 on ebay. That would definitely make the mentioned Sox pic from 1929. Doesn’t Stars work its way into the team name somewhere? Nice to see they’ve incorporated Nessie onto the front of the shirt. Without looking through all of last year’s tournament, I think the cookie cutter floors outnumbered the original floors. Watching the Indians & Cubs on MLB.tv and I feel bad for Cubs reliever Jeff Muyco. First, the Cubs announcers didn’t know how to say his name. Second, he got stuck with jersey #88 with no name. The worst though, was the adjustable cap. I missed the shot of the velcro back, but you can see the New Era logo on the side. [quote comment=”382582″]Watching the Indians & Cubs on MLB.tv and I feel bad for Cubs reliever Jeff Muyco. First, the Cubs announcers didn’t know how to say his name. Second, he got stuck with jersey #88 with no name. The worst though, was the adjustable cap. I missed the shot of the velcro back, but you can see the New Era logo on the side. Well, they wore the pinstripes today. So at least the kid got to wear a real jersey. Every other time I’ve seen them this spring, they’ve been in the BP caps & jerseys. I say NNOB real jersey/adjustable cap is still better than BP jersey & cap. dont know if this was posted to the blog anytime this past weekend. What is the tail/line called in the Dodgers’ wordmark? I love the wire service columns and all the great pictures. Hopefully I’m not repeating something posted in recent days. The World Women’s Curling Championship is being held – and the Norwegians have managed to out-do the men with the pants!!!! Also, Canada’s Jennifer Jones (center in this picture) goes near the top of the list of favorite curlers. But seriously, Dillon, comfort/aesthetics aside, clearly your coach doesn’t understand that you’re more likely to get a low pitch called a strike if you wear jammy pants. How dominant is Hutson if you take out wartime? 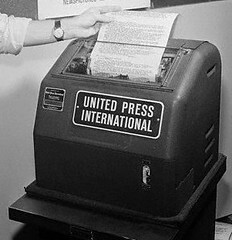 Ooh, I turned on the telly (yes, none of this MLB.TV nonsense here) just in time to catch Len Kasper say “My-co or Mooey-co” as young Mr. Muyco was heading to the dugout and then deliver the correction “Moy-co” in the bottom of the inning. Did they actually say anything about the adjustable cap? I must say Paul, I love the wire service posts. Those pictures are always incredible to see. Oh, and Happy 29th Birthday! Technically, I think it is, though it doesn’t really look it because it’s so dark. If you match it in photoshop or paintshop or whatever, it has an RGB value of 32,55,49. If you mess with the luminance to make it lighter and keep the same ratio of colors… you end up with something resembling aqua. [quote comment=”382589″]Hopefully I’m not repeating something posted in recent days. I first posted that clip in the “Curling for Dummies” piece during the Olympics. Among other coaches, Roy Williams complained that the NCAA logo sticker over the NC State logo at the RBC Center in Raleigh a few years ago was slick and could cause player injuries. I would expect that this also happened at several other sites, so the NCAA just eliminated that possibility altogether by going to their own courts for the tourney. [quote comment=”382599″][quote comment=”382589″]Hopefully I’m not repeating something posted in recent days. Pfeh. The men stayed mostly within team colors, and added a little bit of style. These women just have Loudmouth pants for Loudmouth pants’ sake. i guess he wants everybody uniform, but truth be told, my opinion is that your coach has a pea brain. It is green St. Patty’s day jerseys?